I recently attended a Queen Ann chair class at Hobbs Furniture in Hertford, North Carolina - right on the northeast coast. I had such a great experience at the class that I felt compelled to share it with some of my fellow WWA members. I had first learned of Hobbs' classes through a newspaper article that ran in the Virginia Pilot back in 2000. My mother-in-law lives in Virginia Beach and saved me a copy of the article - saying that I should try to go down for a class because it sounded like such a fun place. The Hobbs school was also featured in the October 1999 (#138) issue of Fine Woodworking which gave it a very favorable review. One of the things that really impressed me about the Hobbs class style was that it was a full immersion experience. The Hobbs family actually owns two businesses that work together to make the class such a unique experience - Hobbs Furniture Classes and Beechtree Inn Bed & Breakfast. The Hobbs Furniture Classes are run by Ben Hobbs who has been building period and reproduction furniture for over 25 years. The Bed and Breakfast is run by Ben's wife Jackie who does an amazing job keeping track of the class progress and making sure everything runs on schedule. During the week at the class, the students stayed in one of several refurbished colonial houses (cottages) that are scattered around the property. Each of these cottages is fitted with colonial and period millwork and all furnishings were built by Ben in the shop. The bathroom and utilities are fully modern, but everything else makes you feel as though you had just stepped back in time. There is a picture of the house I stayed in below. I arrived at the Inn on Sunday night - checked in and meet with Ben for a quick tour of the shop. 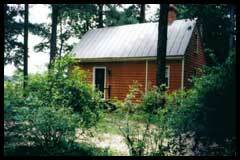 The shop is located in one of the outbuilding on the property, within 100 feet of the collection of cottages. The shop is set up well for classes with several large workbenches each equipped with four vises. Each student had a storage drawer which was stocked with the tools that he would be using throughout the week. Ben told me to meet at 7:30 for breakfast at the house the following morning. Ben and Jackie's house was furnished with a variety of period furniture, some that Ben had built and others that were antiques collected over the years. The typical day began with a class breakfast at 7:30 in the Hobbs main dining room. Jackie prepared some great meals throughout the week. The main framework of the class schedule was that class started at 8:00 and ran till 12 for lunch, then back to the shop from 1-6 PM. We started Monday morning and ran until afternoon on Saturday. We ate our breakfast and lunch together as a class which provided plenty of time for additional discussions and getting to know one another. The Queen Anne chair class was relatively small. With only three students we each got a tremendous amount of individual attention over the course of the week. The basic format was for Ben to explain a series of steps that we would be doing for the next couple of hours and then let us work on our chairs as he went from student to student and worked with them on improving their skills. Starting with the front legs we progressed through the turning of the foot pads and shaping the cabriole legs - by the end of the first day we had the front leg and stretcher assembly completed. Ben stressed the use of a variety of hand tools and his explanations included not only the use of a particular tool, but often the history, adjustments, and care of the tools. This was my first experience using a compass plane and a curved spokeshave. Throughout the week we continued progress on our chairs - meeting set goals for each day. Ben kept the course on schedule and provided a fun, stimulating learning environment. There was plenty of interesting stuff to stay busy in during the evenings after class. Ben has a huge collection of woodworking books, several of which I would borrow in the evenings for bedtime reading. Each cottage had a TV / VCR / Cable, so it was not hard to fill the small amount of downtime that was available. 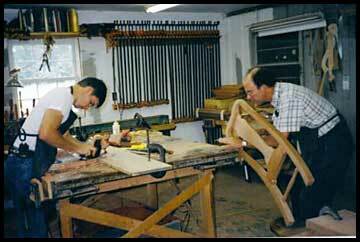 By Saturday morning, the chair was assembled and most of the main work was completed. 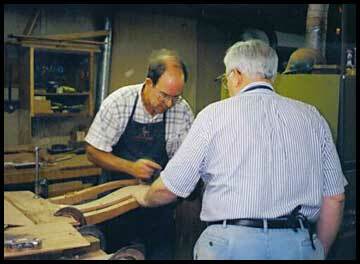 We finished shaping the sides of the front legs and started preparing the slip seat for the chair. I had no idea that the class would also include a complete demonstration of how to build and upholster the chairs. Each of us left with a slip seat upholstered and covered in muslin. We had a group discussion on staining and finishing the chairs on Saturday afternoon and everyone gathered their things for the trip home. 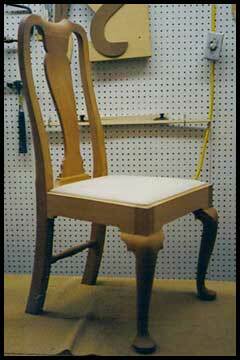 The finished chair is shown below, resting on my workbench at home awaiting the final sanding, staining and finish. I have already signed up for two additional classes with Ben in the coming year. I believe that it was by far the best woodworking class I have attended and the information and experience was well worth the price of the class. You can get more information about the Hobbs Furniture classes and the Beechtree Inn by visiting their website or call Ben and Jackie at (252) 4267815.